LUPUS SYMPTOMS can be decreased without nasty side effects. Maitake mushrooms are well-known for their medicinal use as an Immunomodulator. An immunomodulator is a process of enhancing, stabilizing, or depressing the immune system depending on circumstances. Depressing the immune system may be desirable when experiencing the effects of autoimmune diseases. Since many Lupus treatments work similarly to Maitake Mushrooms, it can be a great alternative to add to your daily regimen. Less terrible side effects with BETTER, SAFER, & FASTER results. FORGET WHAT IT FEELS like to wake up in pain everyday! I was diagnosed with metastatic thyroid cancer 2 years ago. After reading extensively about treatment options to oncology patients using this, so I used this for about 6 months from another site and saw it was available here. So, I’ve found my new go-to place. I recently had clear scans and no tumor markers in my blood work! Tumor inhibitor (thanks to its benzaldehyde, lentinan and KS2 content). Maitake mushrooms are well-known for their medicinal use as an immunomodulator. An immunomodulator is a process of enhancing, stabilizing, or depressing the immune system depending on circumstances. Since many Lupus treatments work similarly to Maitake Mushrooms, it can be a great alternative to add to your daily regimen. Less terrible side effects with BETTER, SAFER, & FASTER results. They have IND (Investigational New Drug) approval from the FDA for its Pro Maitake D-Fraction (Tincture) for Phase II clinical studies on advanced breast and prostate cancer patients. It is rewarding and promising to see a supplement company have such success in obtaining IND approval for a dietary supplement product since this has traditionally been regarded as a process by which giant pharmaceutical companies develop new drugs. Immunomodulation is the process of enhancing, stabilizing, or depressing the immune system, of course depending on circumstances. So, for those with autoimmune diseases, it’s best to regulate it instead of boosting it. Beta-glucans from maitake mushrooms have been shown to play a key role in the immunomodulatory process. Basically, polysaccharides from the maitake mushroom act as immune system regulators. D-Fraction is described as a polysaccharide that is extracted from maitake mushrooms. 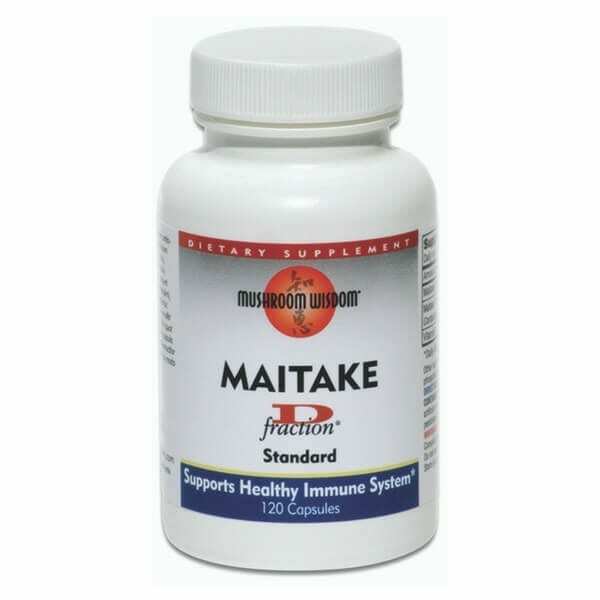 There are reports in phase II studies that have found Maitake mushrooms are an antitumor effect through activation of immunocompetent cells, including macrophages and T cells, with modulation of the balance between T-helper 1 and 2 cells. Reactive molecules in our body called hydroxyl and superoxide radicals are broken down by the antioxidants isolated from maitake mushrooms. These antioxidants may play a critical role in several diseases, such as hypertension, cardiovascular disease, and myocardial infarction. Incorporating this into your daily regimen with its naturally occurring antioxidants, including its phenols, flavonoids, ascorbic acid, and α-tocopherol can be a beneficial strategy in protecting the body against diseases associated with oxidation. Beta-glucan is a polysaccharide fiber that is in the Maitake mushroom. D-Fraction is an isolated compound of beta-glucan that helps activate certain immune cells in your body to improve your resistance to infections and other conditions. Also, it can repair damaged tissues‚ increase the number of immune cells‚ and remove cellular wastes. Studies reveal that maitake mushroom reduces insulin resistance by your body and maintains healthy blood glucose levels. It may also improve your lipid profile and support certain facets of heart health. The presence of fiber in this mushroom could potentially increase the feeling of fullness and keep you from overeating‚ thereby promoting weight loss. Support your body with a healthier lifestyle through proper diet. Avoiding processed foods, high sugars, and reducing complex carbs can help tame chronic inflammation. Adding more organic vegetables and whole foods can support your immune system too! Drink plenty of filtered water so that you don’t feel thirsty. By giving your immune system the support it needs, you can feel less severe symptoms of a disease. Order now!